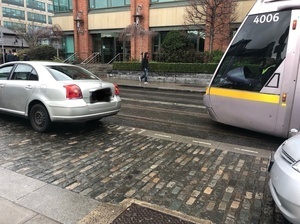 Just now – parked car on the Luas IFSC- it’s okay though, they left their hazards on! 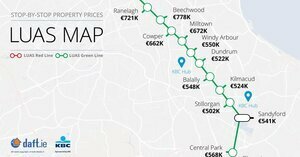 Posted in Misc and tagged Luas at 12:26 pm on March 8, 2019 by Bodger. 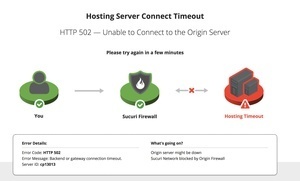 The website of Dublin’s tram service is offline with a message claiming it has been hacked. Users trying to access luas.ie are seeing a message which threatens to “publish all data and send emails to your users” unless “1 bitcoin” is paid in five days. 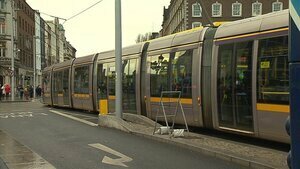 Luas said on Twitter that it has technicians working on the issue and travel updates will be made on its Twitter account. Posted in Misc and tagged Hacking, Luas at 12:09 pm on January 3, 2019 by Bodger. Posted in Misc and tagged Luas, Red Line at 9:54 am on September 26, 2018 by Bodger. 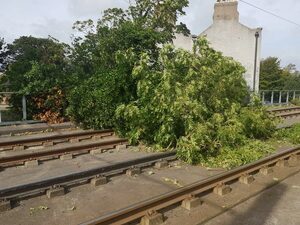 Posted in Misc and tagged Luas, Storm Ali at 1:55 pm on September 20, 2018 by Bodger. On the Luas @ Stillorgan [Dublin[ 4] Anyone??? 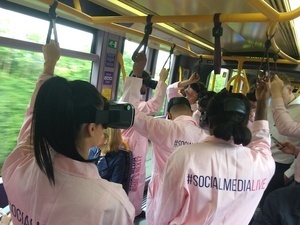 Posted in Misc and tagged Luas, virtual reality at 9:28 am on July 18, 2018 by Bodger. Whose Luas Is It Anyway? Planning Permission is generally required for advertising & is usually subject to approval by the County Council. 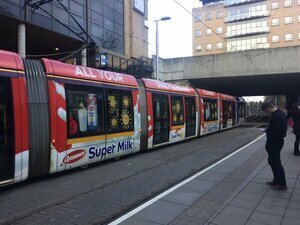 Is that the same for advertising on the Luas? Posted in Misc and tagged advertising, Luas at 10:52 am on March 29, 2018 by Bodger. 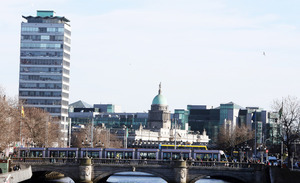 The Dáil has been told that passengers taking the new Luas Cross City line at rush hour would be “quicker walking” because of congestion in Dublin city centre. The claim was made by Fianna Fáil’s transport spokesman Robert Troy. He said he took the Cross City line from Dawson Street to O’Connell Street this morning “in order to experience for myself the length of time”. “It took 20 minutes, I would have been quicker walking,” he said. “Coming back I took a taxi in order to be here for Question Time. [It took] 25 minutes. Posted in Misc and tagged Luas, traffic at 1:27 pm on February 15, 2018 by Bodger. 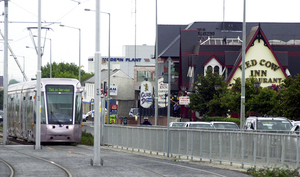 An extra long 55m tram Luas tram crosses O’Connell Bridge. The longer tram has caused disruptions on the bride since its introduction last month. Seven more will be in service by April. Posted in Misc and tagged Luas at 2:22 pm on February 12, 2018 by Bodger. On the second day of its operation, Tram No 5027 failed to clear O’Connell Bridge northbound with the rear of the carriages jutting out and blocking traffic on the South Quays. The tram, which has two extra carriages compared to existing trams, was itself blocked beforehand by a taxi parked in a yellow box. 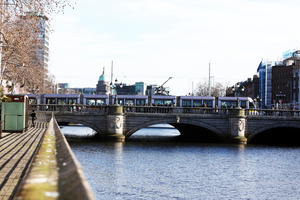 …City traffic planners had warned that the new large Luas cannot stop on O’Connell Bridge without blocking traffic. This was one of the reasons put forward for traffic restrictions on Bachelor’s Walk on the North Quays. …Luas operator Transdev is currently operating just one 55m tram each day, but there will be seven in service by April. Posted in Misc and tagged Luas at 3:56 pm on February 8, 2018 by Bodger.